Unless you’re lucky enough to live in a Disney fairy tale, you will have experienced a break-up. Although come to think of it most Disney films aren’t quite the straightforward love story that we remember. I’ve been unlucky (or possibly lucky) enough to experience my fair share of breakups, but none of them have had quite the same effect on my love of food as this one. Don’t worry, this isn’t going to be a melancholic post filled with despair, quite the opposite actually, as the past two months have somewhat changed my love and appreciation of food. I’ve always been strong minded and strong willed, but for the first time my body didn’t follow suite. Following four weeks of actively avoiding food and not wanting to cook, I wondered whether my passion of food and cooking had also upped and left for good. Lots of research later, and I now realise I had unintentionally signed up to ‘the break up diet’. Oh yes, it has a name. But oh no, this isn’t the ‘two fingers up to your ex’ let’s get back into shape and love ourselves again sort of diet. Having previously been more of a ‘sit on the sofa with my best friends Ben & Jerry’ sort of girl, it’s safe to say that the past two months have been a real learning curve. So, the basics of ‘the break up diet’ are as follows; your body interprets a break up as a stressful event which can put your body into fight/flight mode, shutting down non-essential systems like your appetite. Add to this a few spikes of anxiety which means your body will release adrenaline which slows down processes in our body like digestion making us feel less hungry – and it’s a viscous circle! I started writing this post shortly after the break-up hoping to end on what sort of food would appeal to anyone in this situation but having trawled the aisles of the supermarket the answer is quite literally nothing. I’ve seen posts about different superfoods to try, but without any appetite to eat it really is unfortunately a case of time – of riding the whole thing out whilst making sure you look after yourself as best as you can. In the past few weeks I still haven’t rediscovered my full passion of cooking but am starting to cook more comfort food. Perhaps it’s because of the cold weather we’ve recently had, perhaps it’s because we crave that familiarity. However the sun is starting to come through and the days are getting longer so I’m confident that it won’t be long before I’m back in the kitchen for hours on end (or out with the BBQ!). So my answer to anyone finding themselves in this situation is to ride the wave, be kind to your body and don’t put pressure on yourself to be ‘normal’. Time really is a great healer, and things will eventually work themselves out if you allow them to. Oh, and hot cross buns are a great one for breakfast – genuinely. Unless you’re reading this past Easter, in which case I apologise! I can’t believe we’re in to October already – where has the year gone! I’m sure that October is meant to be the end of my home growing project, although the tomatoes still appear to be in great abundance and I have a new aubergine attempting to grow. Who knows if he’ll make it – here’s hoping for a mild month. Fruit: apples, blackberries, elderberries, figs, grapes, pears and quince. I’ve made a fantastic butternut squash soup before with warming chilli and parmesan which is just delightful – so if the cold weather sets in, opt for a bowl of that with some fresh crusty bread. I set myself a challenge of making sweetcorn the star of the show in every evening meal I cooked last week – which encouraged me to cook meals I’ve never done before. Who would have thought that this little vegetable could be quite so versatile! Always a pioneer, and keen to maintain it’s legacy as European Green Capital 2015, Bristol has become a keen advocate for Urban Farming. What’s now particularly exciting is the diversity of urban farming – no longer limited to vegetables, Bristol is even home to Street Goat, a collective of people raising, milking and eating their own goats. ‘Urban Farming’ is a simple concept – farming that would previously have been done on the rolling hills of a farm or estate have been adapted to suit farming often on a small scale within the urban city. There are many advantages of this, such as addressing issues with space – but more beneficially it is bringing people together from different backgrounds and creating new communities – whilst also regenerating some derelict neighbourhoods. Grow Bristol’s microgreens are an absolute delight, and happily they’re starting to be stocked in a few shops including Hugo’s Greengrocer in Bedminster and Better Foods. The intense flavour of leek and coriander in the micro greens are quite amazing, and not expected. Definitely one to try. I hadn’t heard of this before writing this article – aquaponics are used to recycle waste to grow food and to help conservation efforts. Bristol Fish Project produce fish and plants for eating, in a continuous cycle. Not only that, but they are focusing on helping with Eel conservation. Beautiful! What a fantastic idea! The idea is just beautiful – joining communities together to improve overgrown land in and around Bristol by keeping dairy goats. 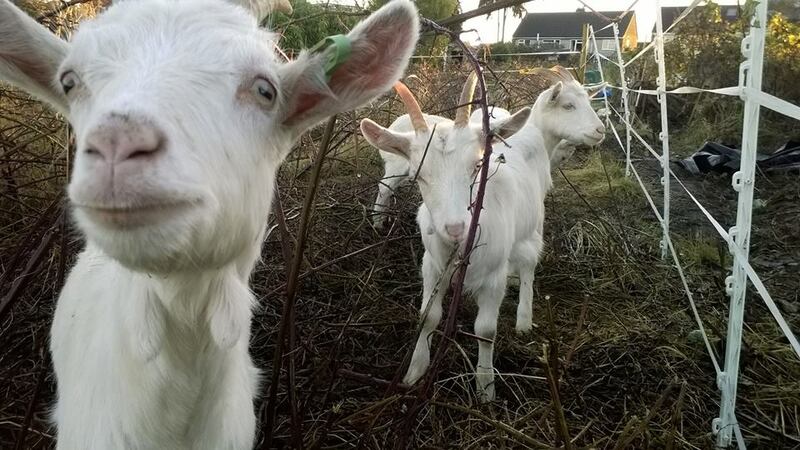 Goats are a great gardening assistance – loving pesky weeds and brambles which is good – as we hate them! Dairy goats means milk, which also means cheese and yoghurt. Delightful! An Bristol veteran, The Severn Project supply numerous restaurants and shops across Bristol with their salad leaves, herbs and vegetables grown in sunny Bristol. The Project provides support and training to people from all walks of life, giving people that helping hand where required to get away from tricky backgrounds and to help them build for a better future. It’s really exciting to see Bristol evolve and indeed pioneer – let’s watch this space over the next few years to see what we can come up with next…! This Middle-Eastern dip lends itself beautifully as an accompaniment to flat bread/tortillas whilst catching up with friends over a glass of wine or even as a great addition to lamb or chicken kebabs – homemade of course! It’s become a staple in our house at the moment with the humble humous taking a backseat. I originally started making baba ganoush on my gas cooker – which actually worked very well – just as long as you prepare your workstation in advance! The arrival of the Big Green Egg has made this process much easier simply nestling the aubergines amongst the hot coals at the end of a BBQ. We’ve Gone On A Summer Holiday..
It’s been almost three months since my last post, but ‘unprocessed eating’ and cooking challenges have been the flavour of the summer (pun fully intended). The past two months have seen a discovery of foreign cooking in Croatia, fresh fishing in Cornwall, two supper clubs and a crash-course in going from cook to chef. It’s safe to say I’ve been hard at work thinking about new blog posts and new tips to share with you as well as challenges of going sugar-free and joining the Great British Chef Cookbook club. The arrival of a new BBQ in June has also opened up a whole new world of cooking challenges and fun – so watch this space for the trials and tribulations…and a burnt spatchcock chicken or two….